In October of last year, my friend Lisa Graystone of Evolution Vintage had featured me on her blog called Evolution Revolution (which you can read here at www.evolutionvtgblogspot.com ) . It is my turn to feature her! If you follow Lisa (@evolutionvtg) on Instagram you will quickly see how much she 1. Loves fashion. 2. Loves her son Blake and 3. Is an amazing Down Syndrome mom and advocate. She is such an inspiration to me in the way that she speaks up for the Down Syndrome community. She is also involved with The National Down Syndrome Society (NDSS) which is a human right's organization who support people with Down Syndrome and their families. They have been this nation's advocate for people with Down Syndrome since 1979. According to www.ndss.com "The National Down Syndrome Society envisions a world in which all people with Down syndrome have the opportunity to enhance their quality of life, realize their life aspirations and become valued members of welcoming communities". They educate the public, support families with resources and fight in Washington for laws that help protect and enhance the lives of people with Down Syndrome. Lisa says, "I became affiliated with the National Down Syndrome Society after I write my first blog for Tori Spellings website emag EdiTORIal (READ IT HERE: http://torispelling.com/2011/10/down-but-not-out/). I have since written 4 pieces you can read on tori's blog. The amazing staff at NDSS reached out to me to introduce themselves after reading the first post and offered any support we needed. After feeling so alone following Blake's at birth diagnosis, the outreach from this organization meant everything. I will be forever grateful for the NDSS for this and all that they do to assist this community. Blake and I were part of an instant community of people who were eager to guide, answer questions and even just listen. Being the person I am I immediately wanted to help the community at large and start advocacy work of my own and education." There will be a gala held on March 10th where there will be auction items and donations given towards NDSS. This is Lisa's 4th year being a part of the NDSS gala/auction committee since Blake was born and I, myself, am so excited to also be able to help this year be a little part of this awesome cause by my donation of a CUSTOM PORTRAIT. According to Lisa, "being a parent is a difficult task and being a parent of a person with extra needs is an exceptional task. It is full of work and struggle, but equally full of rewards! I dream of a world where my son is seen as the person he is and not for his label of 'Down Syndrome' or 'disability'. I consider myself an ABILITY parent, I choose to focus on his abilities and support his challenges. The truth is we all have 'challenges' or issues, things we are better at and items in life for which we struggle. People with Down Syndrome are the same way. They have hopes, dreams, ambitions, likes, dislikes, challenges, strengths and a lot of VALUE. We advocate and educate so people see the ability first and are able to celebrate differences instead of fear or judge them." I just think that is such a beautiful viewpoint and I am challenged and inspired to choose to look at all people this way! Recently I did a portrait of writer and stylist Lisa G of Evolution Vintage. I was so inspired to paint this beauty wearing the stunning headpiece from The House of Kat Swank. 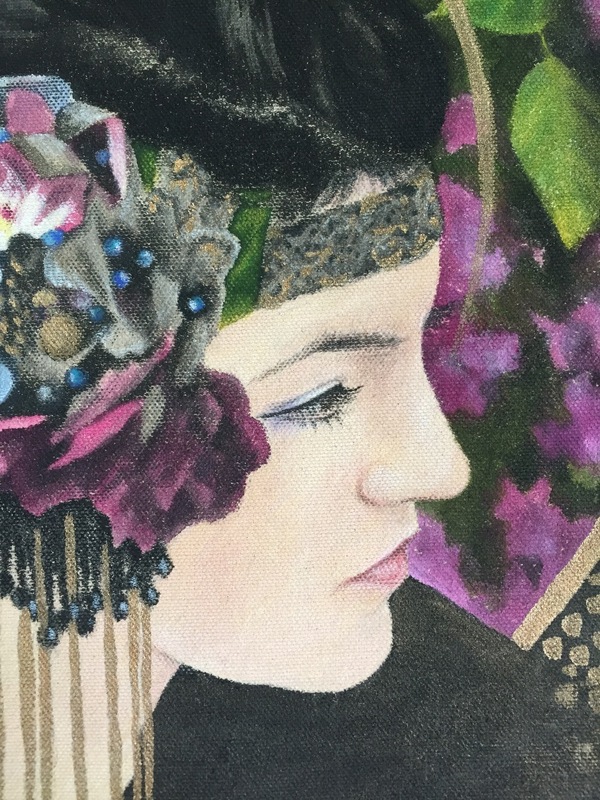 It had a very Art Nouveau feel to it, and to my surprise, after I painted this portrait, I found out that this headpiece was inspired was Alphonse Mucha (Art Nouveau painter from the early 1900's). No wonder! I started of by drawing out Lisa's face and laying some placement lines down for her headpiece. 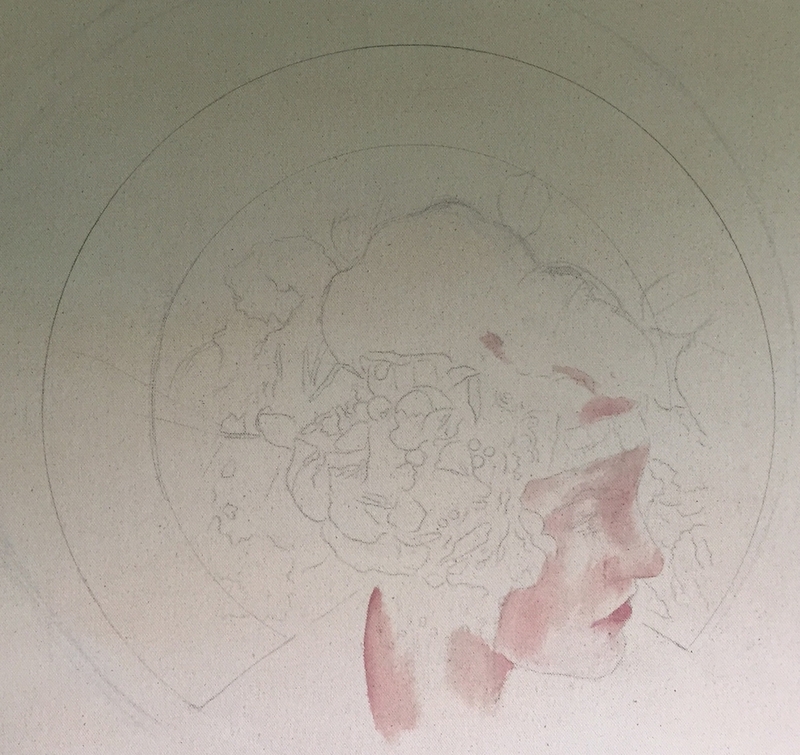 I then placed my circular lines down where I felt they best framed her head forming my composition. Then I laid down a wash of paint on her face to begin. The beginning of the stellar headpiece and some intense pops of color. The head piece was so intricate and so much fun to do! I just love detail! 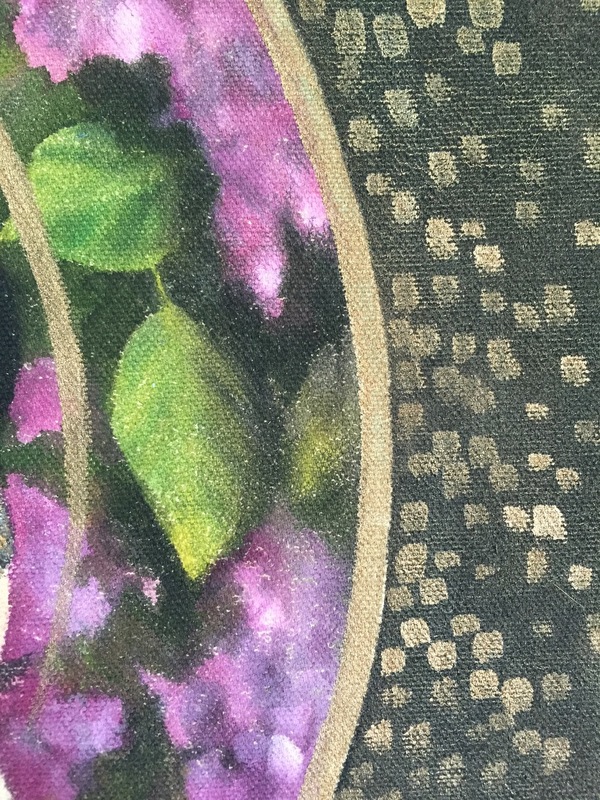 Again, I layered with the paint and colored pencil. Her hair was just paint alone. I loved adding the little gold details in her headpiece! This is the photo I used for reference. 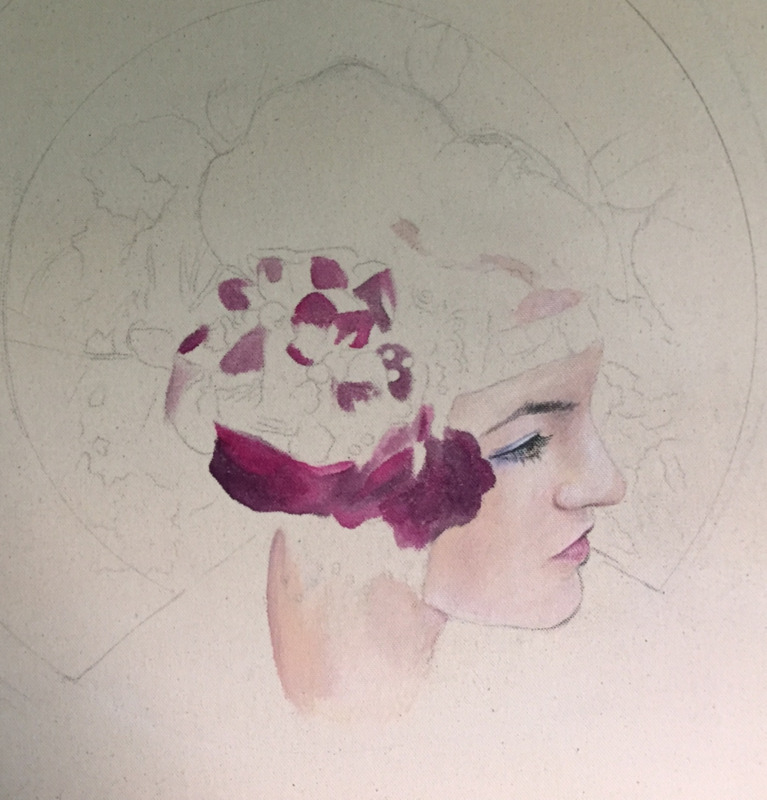 I used the hydrangeas in the background to start filling in the circle. The color in the background really started to make her face pop out more into the foreground. I decided to cut the background up with my circular designs to form some interest. Adding the baby blue sky helped to tie in the blue in her headpiece. I did some gradiant layering on the blue with paint and pencil. I also added a black background which also became part of her shirt and added a gold wash of paint on top of the black paint. Then added more gold paint all over the place...you can never have enough gold! Take note of the peacock sticking out of her headpiece. This was the inspiration for the large peacock feather I added to the design. I had sat at my easel forever trying to figure out what to do in the blue section and in the background. Every design I was thinking of was so complicated and as soon as I thought of the peacock feather I ran downstairs to pluck one out of my husbands stash (which he uses for the flies he ties for flyfishing) and ran up to hold it up to my painting. I had found the missing element! As I held it next to the circle, it drooped to the right like this photo below following the natural curve of the circle. Just as the circle framed her face, the peacock feather framed the circle. It was the simple solution to my problem that was right before my eyes the whole time and it was a match made in heaven! Right away I got to work using my gold pencil to draw on the peacock feather. I was almost shaking with excitement. I just LOVE it when things start to fall into place! 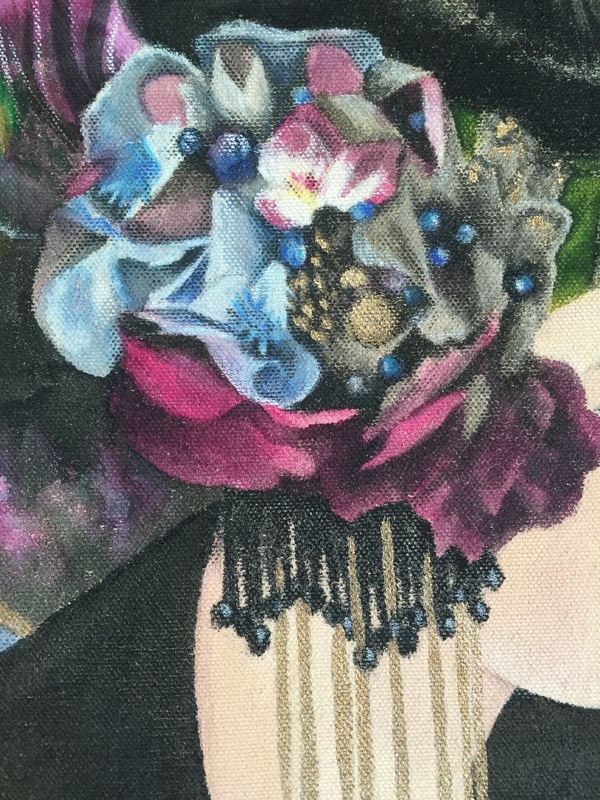 It was crazy because the blue, green, and pink shimmer on the peacock feather helped tie into the colors that were already on my painting. Now there was unity, texture, movement, and glam... BAM!